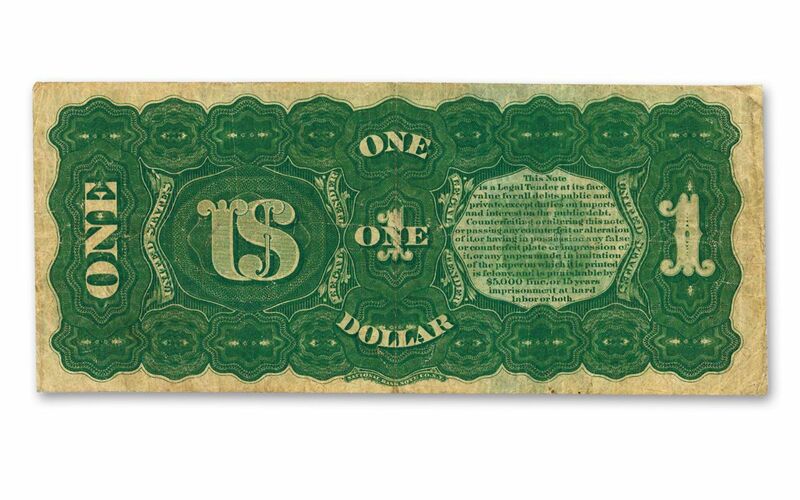 One of the most coveted and sought-after currency pieces in American history is this 1869 Legal Tender Series “Rainbow” Note, so named for the colorful appearance of the front design, which features a red Treasury seal and serial numbers, a green frame around the serial number, a green tint at the top of the note, and a vertical blue tint or “stain” that runs vertically through part of the paper. Not only are the 1869 Legal Tender Series notes the only notes which bear the label “Treasury Note” instead of the label “United States Note,” found on all later issues, this $1 note from the series also marks the very first appearance of President George Washington on any federal $1 denomination bill! Listed as #41 in the book 100 Greatest Currency Notes by Q. David Bowers, the Rainbow Note also features a vignette of Columbus arriving in the New World in the upper left corner. The reverse side is perhaps even more interesting, with an array of continuous geometric “flowers” surrounding the intertwined letters “US” and a block of text describing the penalties for counterfeiting. 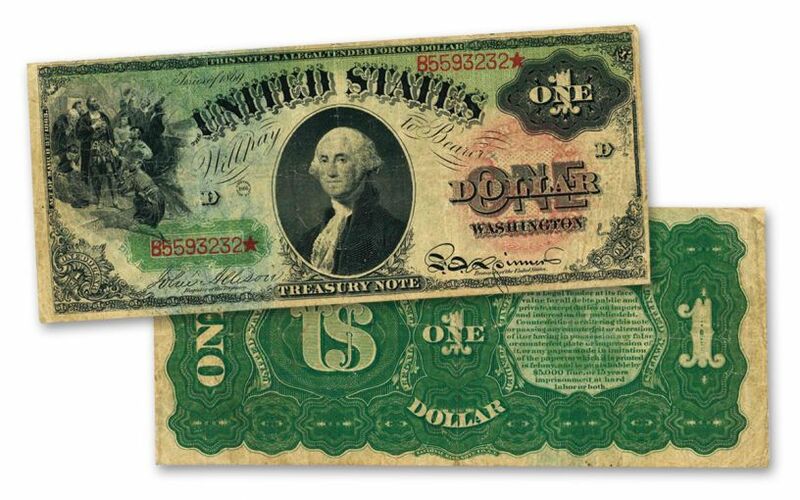 In fact, the term “greenbacks” was used for the notes thanks to their dazzling all-green colored backs. 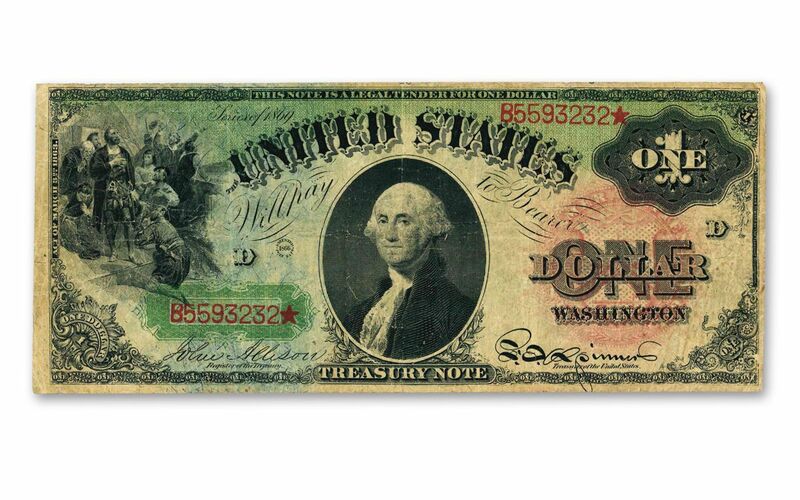 First authorized in 1862, Legal Tender Notes are the longest-lived type of U.S. paper money in the United States. Unlike other paper currency, these notes were backed only by the credit of the government, and none have been authorized since 1869. Your 1869 $1 Legal Tender Rainbow Note will arrive in pleasing Very Fine (VF) condition, protected by a thick, clear archival holder and accompanied by a certificate of authenticity. You don’t need a leprechaun to get you to the end of this rainbow – just secure your beautiful, historic Rainbow Note by clicking it to your cart today!